Golden Retrievers are often used as therapy dogs due to their calm demeanor, gentle disposition, and friendliness to strangers. During World War II, Corporal William Wynne found an adult, female Yorkshire Terrier abandoned on the battlefield; he named the dog Smoky. Smoky began as a therapy dog when Wynne was hospitalized for a jungle disease. As Wynne recovered, his friends brought Smoky to the hospital to cheer the soldier up. Smoky immediately became popular with the other wounded soldiers. The commanding officer, Dr. Charles Mayo (of the Mayo Clinic), allowed Smoky to go on ward rounds and also to sleep with Wynne on his hospital bed. Smoky’s use as a therapy dog continued for 12 years, during and after World War II. The systematic use of therapy dogs is attributed to Elaine Smith, who worked as a registered nurse. Smith noticed how well patients responded to visits by a chaplain and his Golden Retriever. In 1976, Smith started a program for training dogs to visit institutions. Other health care professionals noticed the therapeutic effect of animal companionship, such as relieving stress, lowering blood pressure, and raising mood, and the demand for therapy dogs continued to grow. In recent years, therapy dogs have been enlisted to help children overcome speech and emotional disorders. A therapy dog, common at many disaster sites. In 1982, Nancy Stanley founded Tender Loving Zoo (TLZ), a non-profit organization that introduced animal therapy to severely disabled children and convalescent hospitals for the elderly. She got the idea while working at the Los Angeles Zoo, where she noticed how disabled visitors responded eagerly to animals. She researched the beneficial effects that animals can have on patients and then began taking her pet miniature poodle, Freeway, to the Revere Developmental Center for the severely disabled. Inspired by the response of the patients and the encouragement of the staff, she bought a van, recruited helpers and persuaded a pet store to lend baby animals. Soon requests for TLZ visits were coming from schools, hospitals and convalescent homes throughout the county. Partly as a result of Stanley's work, the concept of dog-therapy has broadened to "animal-assisted therapy" or "pet therapy", including many other species, such as therapy cats, therapy rabbits and therapy birds. Research indicates that interaction with therapy dogs can temporarily affect the release of various neurotransmitters in the brain; levels of oxytocin (linked with bonding) and dopamine (involved in the reward-motivation system) are increased, while cortisol levels (an immunosuppressant associated with stress) are decreased. One example of the use of therapy dogs is the building of self-confidence. Many children have difficulties reading. As a result, they can develop low self-esteem when reading in public. By reading to a dog, children relax and focus on the dog and 'the reading', therefore building self-confidence. Therapy dogs are usually not service or assistance dogs but can be if designated as such for people with PTSD. Service dogs perform tasks for persons with disabilities and have a legal right to accompany their owners in most areas. In the United States, service dogs are legally protected at the federal level by the Americans with Disabilities Act of 1990. Therapy dogs are not trained to assist specific individuals and do not qualify as service dogs under the Americans with Disabilities Act. Institutions may invite, limit, or prohibit access by therapy dogs. If allowed, many institutions have rigorous requirements for therapy dogs. 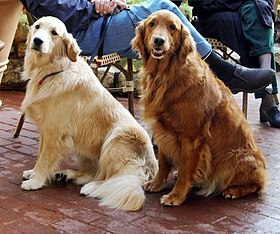 Many organizations provide evaluation and registration for therapy dogs. In the United States, some organizations require that a dog pass the equivalent of the American Kennel Club's Canine Good Citizen test and then add further requirements specific to the environments in which the dogs will be working. Other organizations have their own testing requirements. Typical tests might ensure that a dog can handle sudden loud or strange noises; can walk on assorted unfamiliar surfaces comfortably; are not frightened by people with canes, wheelchairs, or unusual styles of walking or moving; get along well with children and with the elderly; and so on. In Canada, St John Ambulance provides therapy dog certification. In the UK Pets As Therapy (PAT) provides visiting dogs and cats to establishments where pets are otherwise not available. Some colleges and universities in the United States bring therapy dogs to campus to help students de-stress. These campus events are often referred to as "Therapy Fluffies", a term coined by Torrey Trust, the original founder of the UC San Diego therapy dog de-stress event. In 2009, Sharon Franks, shared the idea of bringing therapy dogs to campus with the UC San Diego Office of Student Wellness. Similar events have been held worldwide. In 2014, Concordia University, Wisconsin became the first university in the U.S. to adopt a full-time therapy dog to its campus in Mequon, WI. The golden retriever, Zoey, is a Lutheran Church Charities K-9 Comfort Dog, trained to interact with people at churches, schools, nursing homes, hospitals, events, and in disaster response situations. ^ "Animal Assisted Therapy in Mental Health" (PDF). The SCAS Journal. 2010. Retrieved 2012-07-29. ^ "Information Resource on Assistance Animals for the Disabled". Nal.usda.gov. 2011-09-19. Retrieved 2012-04-28. ^ "Stressed? Therapy Fluffies to the Rescue". 2010. Retrieved 2013-03-25. ^ Craig, McCarthy. "K-9 Comfort Dog Arrives on CUW's Campus". cuw.edu. Concordia University Wisconsin. Retrieved 28 May 2014.